Nestled between two large bodies of freshwater, Lake Winnipeg and Lake Manitoba, the Interlake region has an abundance of possibilities for visitors. Whether you seek history recaptured in Lower Fort Garry, or a relaxing resort experience on Hecla Island, the Interlake will offer it. 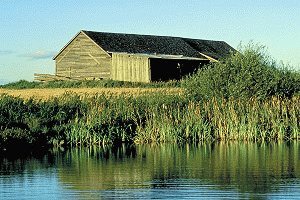 Book accommodations in the Interlake region today! The largest community in the region, Selkirk is steeped in the history of the days of the settlers. Explore this history at Lower Fort Garry, where the Hudson's Bay Company administered the Northern Manitoba fur trade in the 19th Century. Once a very popular tourist destination similar to Grand Beach and Victoria Beach on the eastern side of Lake Winnipeg, this spot is found crowded on summer days and now features a beautiful provincial park alongside its waterside. Gimli was originally a very quiet Icelandic fishing village, but is now a premier tourist resort. Icelandic festivities are held year-round and welcome visitors! This spot is one of the most luxurious resort areas in the Interlake with a large hotel, marina and championship-level 18-hole golf course.